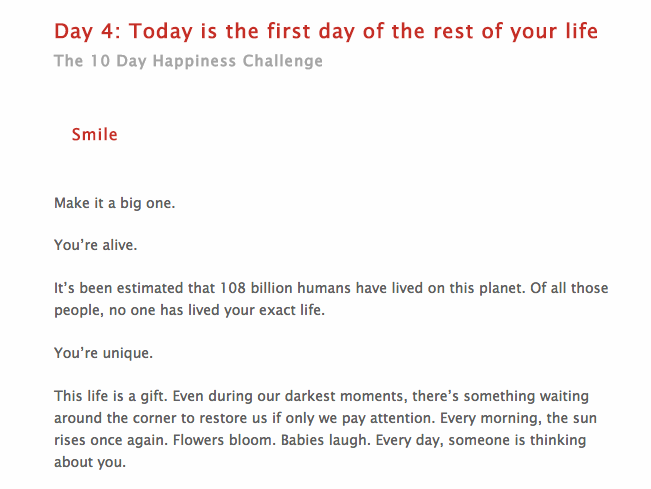 10 Days of Happy helps people develop rituals to start their days as their best selves. Each morning, subscribers receive a 10-minute email containing teachings, parables, or exercises that cultivate the practice of happiness. At the core of it, Happiness is Gratitude, Compassion, and Savoring. It is a quality of a person, and not a fleeting experience. In late 2013, I was struggling with inner contentment due to personal and work relationships and all-around stress. My usual way of dealing with challenges is to push through, try harder, stop complaining. But there was something unsettling feeling emotionally drained every single day. One day while driving to work, I listened to an interview of the Buddhist monk Matthieu Ricard. He was particularly intriguing because he had trained as a scientist with a strong intellectual upbringing before choosing the spiritual route. If there was someone who could reach me with the rational benefits of spiritual practice, it would be him. Neuroscientists at the University of Wisconsin-Madison wired up 256 sensors to Ricard's skull as he engaged in compassionate meditation. Scientists found that his brain produced levels of gamma waves - linked to attention, consciousness, learning, and memory - never before observed in research. You cannot, in the same moment of thought, wish to do something good to someone [and] harm that person. So the more you will bring benevolence in your mind, at every [one] of those moments there's no space for hatred. It's just very simple, but we don't do that. We do exercise every morning 20 minutes to be fit. We don't sit for 20 minutes to cultivate compassion. If we want to do so, our mind will change, our brain will change. What we are will change. Throughout the interview, he spoke of happiness as something we spend time practicing just like we practice an instrument or study for an exam. He also made a strong distinction between the fleeting form of happiness where we chase after experiences vs. an embodiment of happiness that exists despite the good or bad - what he calls a genuine "flourishing". I bought his book and for the first time in my life, began actively seeking the practice of compassion, gratitude, and mindfulness.